As predicted, Civilization developers Firaxis have begun their drip feed of the new cultures coming to Civ VI in its recently announced expansion, Rise and Fall. First up: meet Queen Seondeok of Korea. She ruled Silla, one of Korea’s three kingdoms, from the year 632 to 647. The Korean unique ability is Three Kingdoms, which causes mines to produce bonus Science, and farms to yield bonus Food, if built adjacent to a Seowon. That’s Korea’s unique district, and it replaces the Campus. Seowons must be built on hills and grants a huge initial yield of +6 Science, but this is reduced for every district you build adjacent to the Seowon. The Hwacha returns from Civ V as Korea’s unique unit. It’s a powerful Renaissance ranged unit, but can’t move and attack in the same turn. 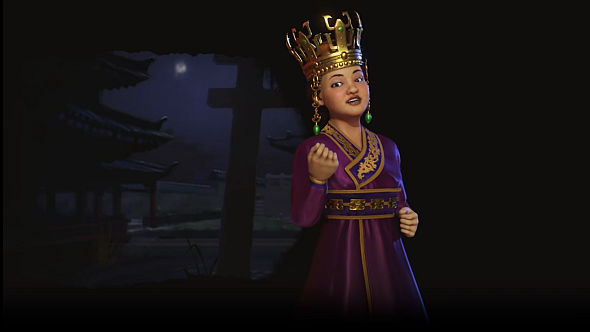 Queen Seondeok’s leader ability is Hwarang, and it ties into the new Governors system: all cities with a Governor get +5% Culture and +5% Science. Finally, Civ VI gets a dedicated science Civ, and they look pretty strong; the Seowon’s +6 Science is huge, especially in the early-game, and assuming a hills start bias, it should be pretty simple to set one up early and surround it with mines for a massive boost to research. A Science lead tends to magnify over the course of the game, so I can see Korea growing to become very hard to stop if not checked. I know who I’m picking for my Deity challenge. Civ VI: Rise and Fall is due on February 8, and will cost $29.99, €29.99, or £24.99. Here’s the Steam page.